An Alpine feel came to Central London’s Battersea Park during The UK’s only Ski and Snowboard Festival – The Telegraph Ski and Snowboard Festival 2018. The event boasted new features to 2018, including Dog Sledding, Snow and Rock-Climbing Wall and Ferris Wheel. Event favourites returned in the form of Mount Battersea, Live Music, Ice Rink and the very best food outlets which offered a variety of choice for Visitors. 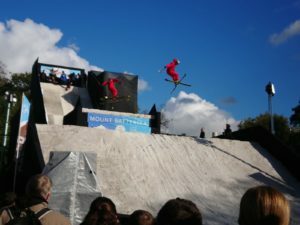 Another firm favourite returned as the event played host to members of the British Ski and Snowboard Team, performing spectacular tricks on Mount Battersea, the famous real snow mountain. Gainsborough Events Management Ltd are proud to continue our relationship with Client and event, with staff on front of house, patrol teams, fully functioning control and out of hours cover from our dedicated night team. The Gainsborough Team look forward to many Years of Ski and Snowboard Festival and contributing to its success.